A Tribe Called Quest have hinted at their imminent breakup after telling audiences at their recent shows in New York and Los Angeles that they would be their final as a group in the cities. At New York's Panorama festival, Q-Tip told the crowd that the show was their last in the city before paying tribute to Phife Dawg, a member of the group until his death in March 2016 after a fight with diabetes. 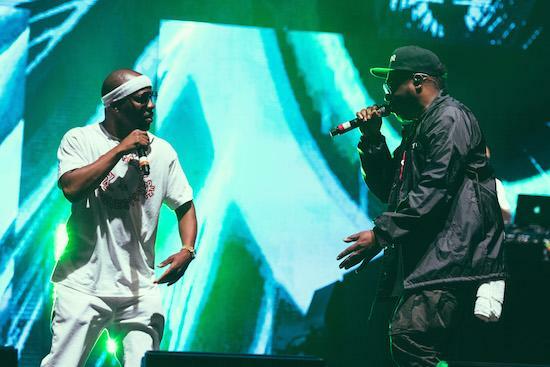 The announcement follows a similar one in Los Angeles, at FYF Festival, the previous weekend where Q-Tip told audiences: "This is our final performance here in LA as Tribe, obviously because Phife Dawg, our anchor, has been called to another mission." The group had returned from an extended recording hiatus last year to record new album We Got it From Here... Thank You 4 Your Service on which Phife Dawg featured, with the album seeing released after his death. The group have four more shows left on their world tour in support of that album, with the final show set to take place at Bestival in Dorset in September.